The Dashboard collection from CT Scuderia is inspired by the speedometers of legendary racing cars and motorbikes. A quick look at the watch and you can immediately see the automotive theme in the different design elements. It is very refreshing to see an original and different design... but I think it falls under the love it or hate it category. Personally, I am not too enamored with the design, but my brother-in-law who also had the chance to see the watch in person loved it. Loved it so much in fact that he wants to buy one. I give CT Scuderia praise for trying to be different and for staying true to their racing themed brand. It is a brand and watch with a clearly defined identity. Dial inspired by speedometers of racing cars and motorbikes. The 3-piece construction 44mm case has the crown located at 6 o'clock, which is where the kilometer reset button was located on vintage dashboards. I love the unique look of the case and the oversized screw-down crown. The main piece is polished while the two attached lug pieces have a satin finish. The two attached lug pieces were noticeably loose on this particular watch, creating a visible gap between the pieces. The front has a sapphire crystal, which I consider a must on any watch over $500, and the back is also open for a clear view of the Swiss movement ticking inside. The 44mm case is made from 3 pieces. In case you did not notice the speedometer look on the dial, the words "MILES-PER-HOUR" is also printed at 6 o'clock to reinforce the overall theme (which quite frankly I found it to be unnecessary and it is also interesting that they used miles instead of kilometers). Though I certainly understand and appreciate the point of these words and the fake 0-120 speedometer scale printed on the dial, I cannot help but feel that it is just not for me. Do not get me wrong though, for an automobile aficionado, the speedometer scale can easily be their favorite part of the watch. To me, the completely decorative 0-120 scale is just too distracting, it can actually confuse you when you are trying to tell the time. Luckily, a red hour scale is also printed on the dial on the inner diameter to help facilitate time telling. The dial lacks dimension/texture, everything is just flat (printed). The love it or hate it dial. The brown leather strap comes with a satin finished spring bar tang buckle with the name of the brand engraved on it (which looks somewhat generic). 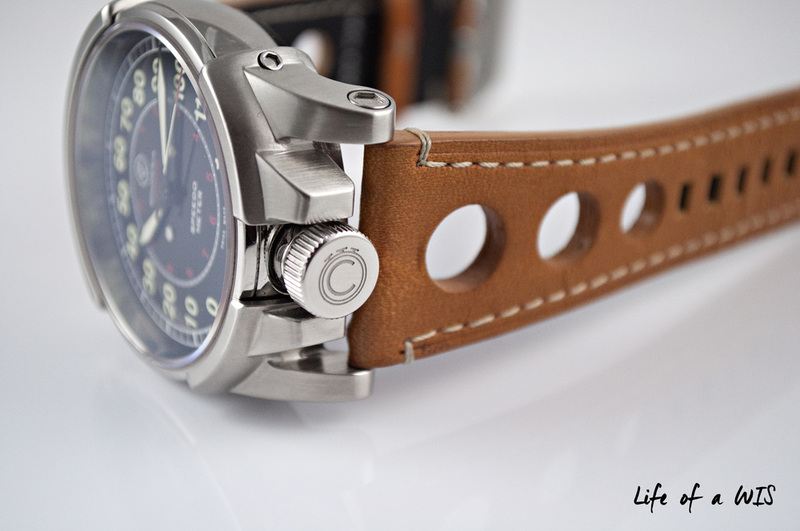 The racing theme continues on the strap with the three holes on each side of the strap (often called a Rally strap). The color and style of the strap matches the overall look and theme of the watch quite nicely. To make changing straps easier, the strap comes with an easy pin mechanism. The multiple buckle holes on the strap allows for a more precise and comfortable fit on the wrist, something that often gets overlooked by many brands (my small wrist appreciates this!). The overall quality of the strap is good and the stitching is perfect... mostly soft, though it gets significantly stiffer as it gets closer to the case. The Rally strap reinforces the racing theme. The Dashboard uses a Swiss Val Suisse 3H automatic movement with 22 jewels. The movement is visually enhanced with blued screws and a rough perlage finish... but the rotor remains unbranded, which I think is a huge missed opportunity. Honestly, there is not much to look at and the finishing on the movement could be improved... one of the few times in which a solid case back might have been a better choice. During my short time with the watch, time keeping was spot on. Swiss Val Suisse 3H automatic movement. The lumed hour, minute, and second hands are easy to read during the day or at night, but again, the 0-120 scale on the dial is distracting... even at night since the scale also has applied lume. It definitely looks cool and will probably turn some heads, but as far as time telling is concerned, it confuses more than it helps. Lume is bright at night. The one downside of having the oversized crown at 6 o'clock is that the strap gets in the way when you are trying to unscrew or screw it. However, once the crown is unscrewed, pulling it out to adjust the time is easy. The oversized screw-in crown at 6 o'clock. The Dashboard has a water resistance rating of 100m, front sapphire crystal, open case back, automatic Swiss movement, screw-in crown, lume, and a very unique overall design and look. A date at 6 o'clock would have been a nice feature to have. The perfect watch for the pit stop. The angled lugs, location of the crown, and tang buckle make this watch quite comfortable. The score could have been higher if the leather strap was softer, specially as it gets closer to the case. At $1,450 retail, this Swiss watch has a lot of positive elements in its favor (e.g. original overall design, automatic Swiss movement, sapphire crystal) but it does so with several flaws as well (loose case pieces, dial design, movement finishing). But if you are looking for an automotive themed watch that is not afraid of being different and daring, then look no further. 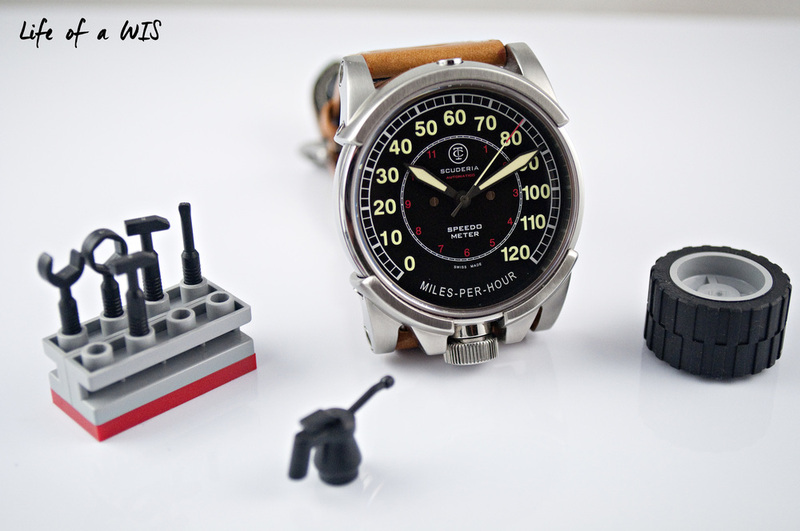 The perfect watch for the automobile enthusiast.